Editor’s Note: This article by Zach Franzen, his first on StoryWarren.com, was posted four summers ago and remains one of my favorite (and SD Smith’s most-quoted) articles, by anyone. I recently read an article urging Christians to be more countercultural. By countercultural I think the author meant that Christians ought to get arrested more often and sing “in your face” anthems at their parents and/or capitalists. Of course, we know that a protest culture isn’t precisely counter to our culture. It’s as mainstream as a discontented child screaming and grasping in a ToysRUs. Still, Christians ought to be more countercultural, and certainly this extends to our artistic and creative offerings. One way to push back at our culture is through the simple elevation of gratitude. Christians see gratitude as essential to happiness, but in our Freud and Marx influenced culture, gratitude is the undignified badge of surrender. Dissatisfaction is seen as the way to rally the masses to overthrow corrupt Western power structures and bring in the Utopia. Gratitude (much like a Norman Rockwell painting) is perceived as an obstacle for vital social change. Gratitude frees us from a preoccupation with self and makes us take pleasure in the good gifts of our Creator. Furthermore, it gives shape to our desire to help the oppressed. One could go on, but the point is that gratitude is a necessary element to human happiness, it pleases God, and is underrepresented by our culture. Let me give you an old-school Dorothy Aldis poem written for children in the 1950s that assumes the pleasure of gratitude. See if the assumptions in this poem don’t strike you with a pang of rightness. Aldis assumes that the reader treasures the smell of flowers and the smell of cookies, then she suggests that the reader make room in their circle of gratitude for ironing smells. If I may steal a theme from Chesterton, it is magnificent to look at the world through a telescope but it is also magnificent to look at the world through a microscope. Tolkien tempered his orc battles and giant spider threats with meditations on the Hobbit’s love of good tobacco and food. Lewis tempered his fantastical never ending winter with the domesticity of the Beavers’ tidy house. Jane Austen novels, The Little House on the Prairie books, Henry and Ribsy, The Moffats, Frog and Toad; all these stories assume the pleasures of gratitude, and the reader gets to enjoy them by proxy. Thankfully, these books are still widely available, and if you want to provide your children with an emotional affirmation of the statement “be grateful,” then you might think about importing these values from earlier literature. That’s not to say they are totally absent from contemporary writing, but they are mostly absent. 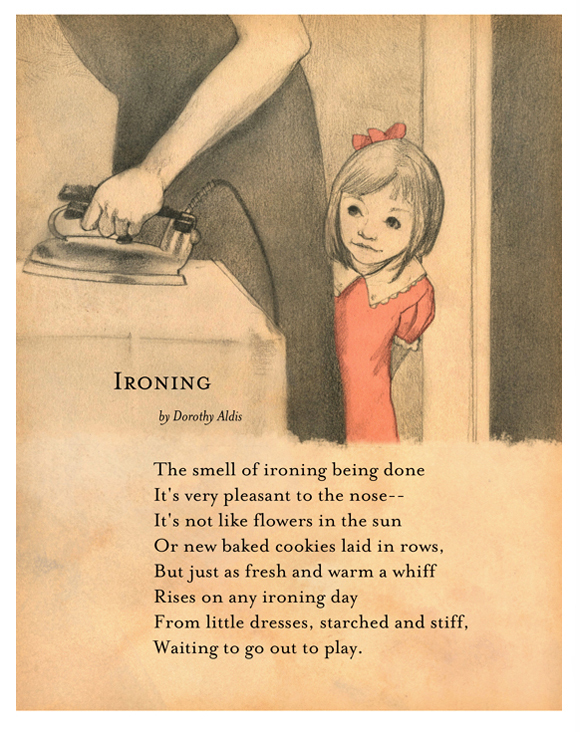 I guess what I’m trying to say is that a poem that zeros in on the appreciation of ironing aromas and the glory of domesticity elevates gratitude. Gratitude is essential for children who will one day build and preserve a society. It is absolutely unessential for those children who wish only to deface society. Note: If you like Dorothy Aldis poems, I have a post about one of her winter poems here on my blog. I didn’t repost it here because we’re in the thick of summer. Love this post, Zach. I’ve been frustrated by the “counterculture” orthodoxy among many artistically engaged Christians. This article provides a nice antidote to that viewpoint. Wow, does this resonate, Zach. It seems that we too often forget that Jesus’s brand of counter-culture was fairly non-militant, and undemanding. Thanks for putting words to this. Thanks for literally making me LOL! I need to read more Calvin and Hobbs! Thanks Loren. Thanks James. Bill Watterson is great, and that’s a terrific comic. I was just having this discussion with my mom this morning. I was really being obnoxious and grumbling about how terrible children are these days, complaining about how they don’t have any manners. They all feel so entitled. Then my friend and I continued the discussion about how Christians aren’t being countercultural enough because we tend to not spur one another on in doing the hard things. I think a good place to start is to teach gratitude. I am working on being grateful myself. Great post.